In the section "Wargaming - Where To Start?" I recommend playing a small game using whatever rules you fancy to get used to the FYOB mechanism. To follow my own advice and as I haven't managed to play a game for a while, I thought I would follow my own advice and play a series of small Starter Games. Here is Game 1 played on a 4ft x 3ft board with less than two dozen figures. I used Rapid Fire! rules because I like them but there is nothing stopping you using anything - even your own home-made rules. I am going to work through the initial series of games as recommended and will post reports here as I do so. 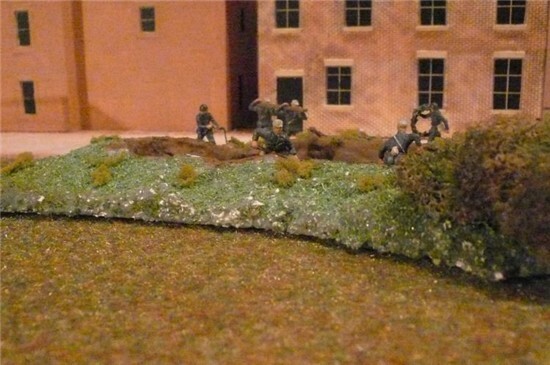 After an initial bombardment, British infantry move into a village. 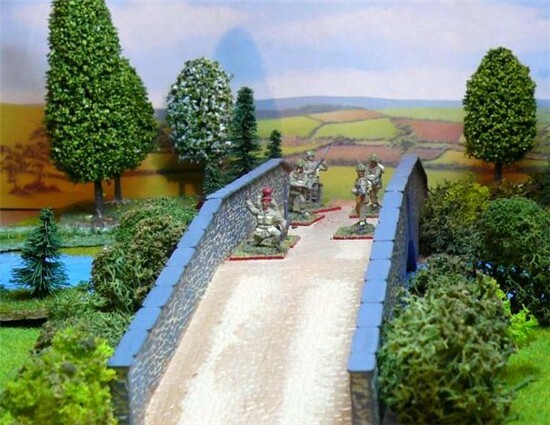 Resin buildings by Airfix. The lack of bases really shows up in this shot. Before the campaign starts, I must set these buildings on to a 60 thou card base and add some rubble and debris. 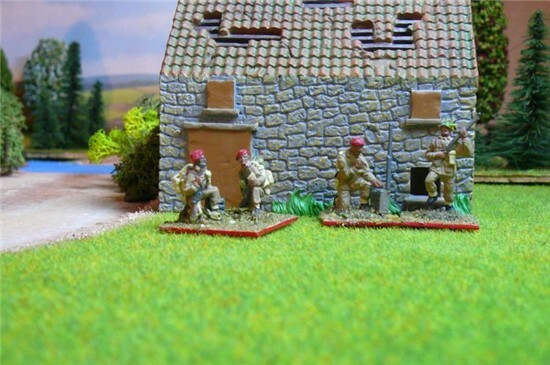 British Paratroops have now been painted and they will appear in the campaign. Their bases are painted with a red rim to note their status as elite troops. 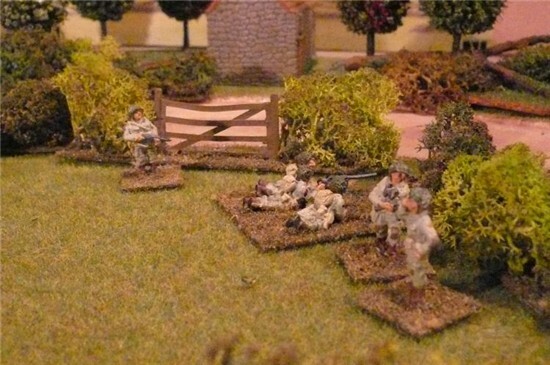 Figures by Revell with some SHQ. 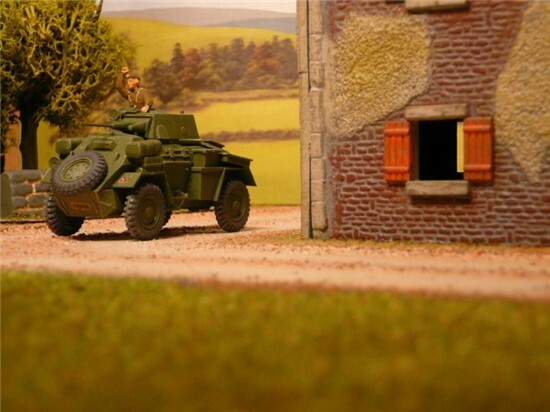 A cruel enlargement showing the Para 2" mortar team (SHQ) and radio man (Revell). The small derelict barn is from the Hornby model railway series. The US Airborne troops are also new to the fold. Again plastic figures are supplemented by SHQ and others. 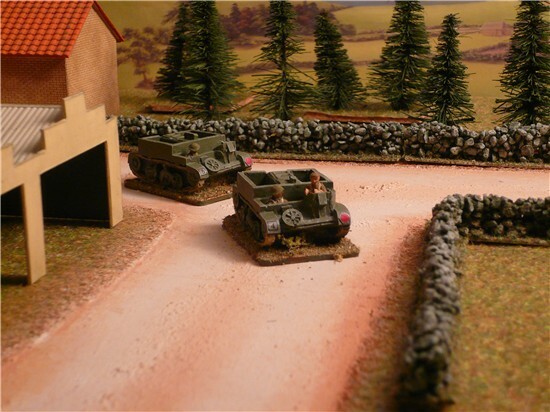 WarModelling supplied a pack howitzer and other oddments. Another recent paint job was the British Commandos. These are nearly all Airfix and, unlike other forces, they comprise a whole bunch of figures in various poses that I will select for each situation they find themselves in. Here, a German guard is about to be jumped whilst on night duty. The unfortunate man is a Valiant figures and even in this photo, the size difference between the Valiants and others is noticeable! Not the best picture but here are some figures modified to become Italian engineers. The two guys carrying the timber at the back are actually Airfix German engineers in new uniforms whilst the diggers in the trench are actually what they started out being. The guy with the rope(?) and the brave lad carrying the roll of barbed wire were both infantrymen but have had their weapons cut away. They may not stand close inspection but simple mods like this are not beyond the average modeller and save a bit of cash!! 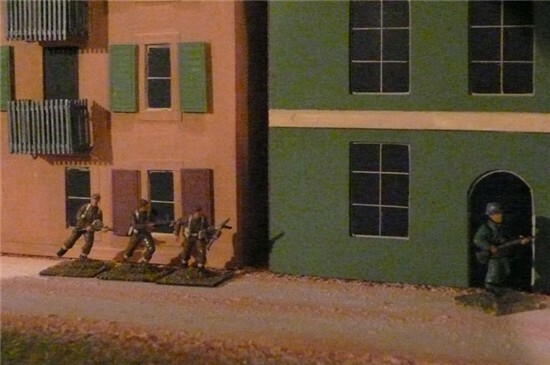 This picture appears elsewhere and was taken during the first Sicily test game - a British recce squadron moving through an Italian held village. Armour played a relatively small part in the Sicily campaign for the Allies. As a series of games, this makes the Allied Command wary of committing big numbers and ensures that infantry support weapons are used wisely. 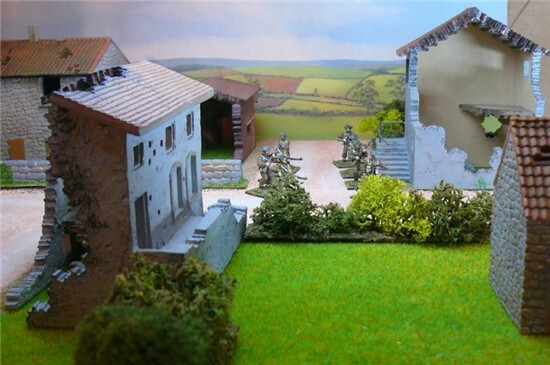 In fact, it's a great opportunity to try out the tactics outlined in the Osprey books for recce and AT warfare.